…. while the Sixers were getting beaten up by the Nets. Amir Johnson and Joel Embiid “starred” in an… unusual moment during Game 1 of the playoffs between the Philadelphia 76ers and the Brooklyn Nets. 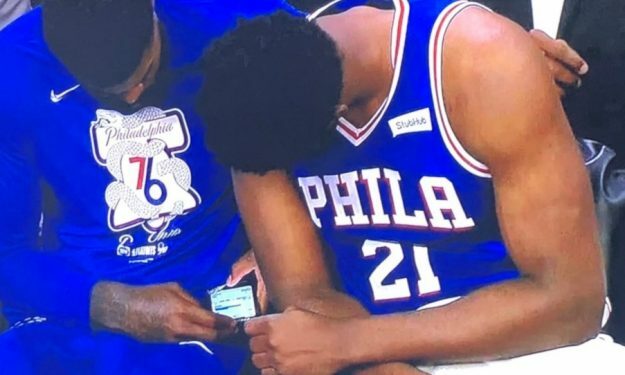 In the mid of the fourth period, the camera caught Johnson checking his cellphone and what appeared to be a text message at the bench of the Sixers. Johnson showed the message on to Embiid who looked at his teammates’ cellphone before returning to the game. The Sixers were trailing by double digits at that moment ahead of getting defeated 110-102 by the Nets. Per ESPN’s Bobby Marks, use of cellphone on the bench violates NBA rules and is punishable by fine and/or suspension.